Speed Demon (275/365 year 3) – Annoyingly Boring? 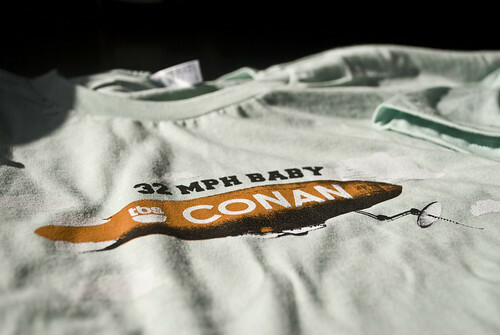 Conan O’Brien and company are giving away 1,000 t-shirts a day leading up to to the launch of his new show on TBS. I was lucky enough to win on on the first day of the promotion. It came in the mail yesterday. I shall wear it proudly. Pat- although I can’t stand Conan, I really like the treatment of this photo. Nice texture in the shirt.